Jordan and Josh Bell are twins who play basketball, following in the footsteps of their father who once played professionally. As basketball season gets underway, the two boys get into a variety of disagreements while at the same time arriving at the realization that their father might have a serious medical problem for which he is stubbornly refusing to seek treatment. Corey Allen does a great job reading this for the audiobook. Days later, I can still hear his voice in my head as I think back over the story. I would definitely listen to more books narrated by him. 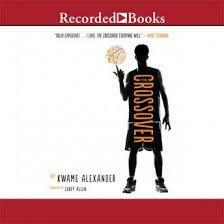 I'm also already planning my next Kwame Alexander read, which I think is going to be Booked.